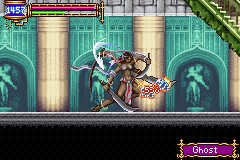 Castlevania: Aria of Sorrow is the last of the Game Boy Advance Castlevania games. It was released on May 6, 2003 and it changed the way I view the series from that moment on. AOS is the best of the GBA Castlevania games. It is quite evident that Koji Igarashi and his team have learned to take full advantage of the Harmony of Dissonance engine and the Game Boy Advance hardware. AOS takes the best elements from the previous two titles and discards the fat. It is also the true successor of Symphony of the Night. In fact, in certain ways, it is a superior game. Dracula is dead. Permanently. His cycle of regeneration was terminated in the year 1999 by a group of Vampire Hunters lead by a descendant of the Belmont clan. The year is 2035, 36 years after Castlevania was permanently imprisoned inside an eclipse over Europe. Soma Cruz, and his friend Mina Hakuba, were on their way to the Hakuba Shrine to witness the first full solar eclipse of the century. On their way to the top of the shrine, Mina and Soma began to slip from consciousness. When they came to, they were greeted outside of a strange castle by a mysterious individual named Genya Arikado. Before Arikado could fully explain the situation, they were all attacked by monsters. Genya defeated them all except one, whom Soma defeated. As the monster was destroyed, the monster’s soul emerged and went inside Soma’s own body. Soma learned that he had claimed dominance over the monster’s soul and could now use its abilities. Arikado explains that Soma must go to the Master’s chamber inside Dracula’s Castle in order to find a way to leave the eclipse. Soma, not knowing whether to trust his new “friend” sets out on his journey to escape Castlevania. This is probably the most original story ever in a Castlevania game. First of all, it is set in the future. Second, your quest is not to defeat Dracula. Third, the traditional heroes are relegated to being the supporting cast, while the unlikely protagonist is hiding (inadvertently) a terrible secret which plays into an awesome twist 3/4ths into the game. And boy is that twist awesome! And fouth, the main and supporting characters are actually cool. I’ve already mentioned Genya Arikado, who plays the mysterious brooding unofficial leader of the vampire hunters. He is normally a cool individual, but he is also hiding a secret that makes him even cooler. Yoko Belnades is a sorceress who can trace her origins all the way back to Trevor Belmont and Sylpha Belnades from Castlevania III: Dracula’s Curse. Soma also meets Hammer, a rough looking softie who develops a crush on Yoko and also acts as the games shopkeeper. There’s also J, the mysterious amnesiac who carries the powerful Vampire Killer whip. And last but not least Graham, the villain of the story. He’s no Dracula, though he’d like to be, but he is an interesting fellow, nonetheless. The least interesting character is Mina Hakuba, Soma’s “love interest.” She doesn’t do much except for giving out messages from Arikado. I have only two complaints about the story. First, though we know there is a character from previous Castlevania games in this one, that character never show’s his face. And second, Death is just a boss like any other in this game. 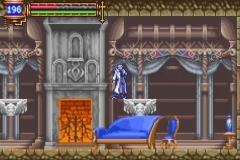 He was an important character in Rondo of Blood, Symphony of the Night, and Harmony of Dissonance and, given the events taking place in this game, you would think that he would be very invested in how the story plays out. However, he doesn’t get involved at all except for the boss fight. The graphics in AOS are excellent. The color pallet is more subdued than in Harmony of Dissonance but it is better suited to the atmosphere of the game. At the same time, they are less extravagant than HOD but much better than those in Circle of the Moon. This balance helped Igarashi and his team by allowing for more processor power to be used for the game’s sound. As a result, the characters are smaller than in HOD but they are greatly animated. And bosses are still huge and articulate. The backgrounds, though not as colorful as those in HOD, are far more detailed. When you fight the Headhunter, for example, there are dozens of heads in the back of the room, presumably used by the Headhunter depending on his mood. This area seems to be inspired by Mombi’s Castle in Return to Oz. And to add to the attention to detail, when you defeat the Headhunter, the heads in the background burst into flame and never appear again. The Headhunter’s Lair: Before and After. There’s also some really cool uses of “Mode 7” graphics in the backgrounds. While HOD used “Mode 7” to display graphical prowess, AOS uses it to actually create atmosphere. There’s an area inside the castle where you can see huge storm clouds in the backgrounds that look really ominous. Other impressive effects are: mirrors that “reflect” the part of the room that we can’t see; a huge beautiful stained glass window; and the corridor leading up to Legion, where his “body parts” are walking in the background towards his chamber. Legion’s chamber also looks particularly creepy also using “Mode 7” to great effect, and it is framed by a wall sculpture which looks like the real Ex Nihilo sculpture. The graphical detail in this scene is outstanding. The bosses in AOS are varied and impressively detailed. Legion and his various falling “body parts” looks amazing, Death looks as cool as ever, etc. There is one boss in particular, Balore, who has an awesome opening. When you enter his chamber, you see a big bat that you think you’re going to fight. Just as you get ready, a huge hand comes out of the left side of the room, grabs and kills the bat, and then throws it away. The new boss is so huge you only get to see his arms and face. Can I fight the bat instead? Last, but not least, are the characters themselves. 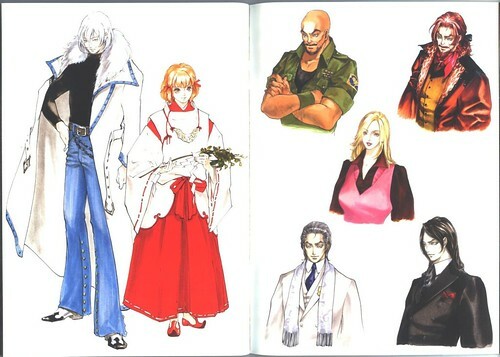 The characters where designed by Ayami Kojima, who also was also in charge of the game’s art in HOD. The characters in AOS, look very detailed and interesting. Of special note are the character portraits that are shown when the characters talk. They are very well drawn and add some sophistication to the presentation. This game has a more sophisticated look than previous GBA Castlevanias, dialogue not withstanding. If there’s one thing I don’t like about the graphics it’s that Soma doesn’t have a shadow trail like Juste in HOD. For me, it didn’t make sense for Juste to have a shadow trail because he is just human. Soma on the other hand, has powers beyond those of normal humans and given how the story twists and turns, it would make sense for him to have a shadow trail. I guess they weren’t happy with how it looked in the previous game and couldn’t make it look any better in this one. The sound design for the game is also excellent. There are a lot of voice samples in the game from the protagonists, his friends, and the even the enemies. They are short and mostly in Japanese, but they are still something that is more prevalent here than in previous GBA Castlevania games. They also add to the personality of said characters. The sound effects for the different weapons and souls are also well done. Each weapon sounds different so, even if you’re not looking at the screen, you know what weapon you are using. The best sound in the game, though, is when you spend an hour fighting an enemy and you finally hear that electric whooshing sound of a soul flying in your direction. The music in this game is exquisite, for lack of a better word. It has to be, after all, since it was composed by Michiru Yamane, the composer from Symphony of the Night. AOS’s soundtrack is not as great as SOTN’s soundtrack but, unlike the dull music from COTM and the garbled music from HOD, this one is just pleasurable to hear. Some of my favorite tracks are Name Entry (I find it very soothing), Castle Corridor (the main track you hear in the castle), Underground Reservoir, and especially Clocktower (it starts slow and until in ramps up into a truly awesome piece). All of these pieces, except for “Castle Corridor,” are piano (fake midi) heavy and sound great. If you like these pieces I urge you to find arrangements, such as this Underground Reservoir Arrangement that sounds amazing. 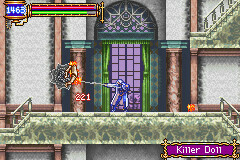 Aria of Sorrow follows the Metroidvania style of gameplay popularized by Symphony of the Night. The controls in Aria of Sorrow are very smooth. Soma feels tight and responsive yet his movements are silky smooth. There is a moment when you are able to turn into a bat and there is no lag in control from when you begin transforming until you become a bat. The controls feel even better than the ones in SOTN. Soma has three equipment slots where he can place weapons, armor, or accessories. It’s less confusing than the equipment system used in HOD, but it’s still just three slots, as opposed to 7 in SOTN. By this game though, I’ve gotten used to this system and understand the need for simplification. I’m just happy that the slots have firm uses instead of the “put whatever you want” system from HOD. Better get used to those three slots. Of course, I can’t review AOS without talking about the Tactical Soul System. It is the best magic system Castlevania has ever had, period. It brings much needed diversity to the gameplay and it is a lot of fun to use. Nobody forgets their first soul. Now, with regards to difficulty, this game is moderately hard. It’s not as difficult as Circle of the Moon, but it is more difficult than the cakewalk that is Harmony of Dissonance. I died a couple of times and I had to grind a little bit to get ahead but, there wasn’t a lot of grinding involved. The game is pretty easy until you get to Death. In fact, Death may inadvertently symbolize the change in difficulty in the game. Death has two stages and the first one is really easy. But when the second stage begins, and he does his best Darth Maul impression, that’s when things get difficult. Soon we will reveal ourselves to the Jedi. Soon we will have our revenge. The game itself is relatively short. I spent most of my time collecting souls. I finished the normal game in 5:34 (hr:min). It took me six more hours to get all my missing souls. After that, I played it in Hard Mode and finished it in 1:54 (you can carry over souls and weapons) and then Julius Mode Mode in 1:36. I played around 30 minutes with the Boss Rush Mode and my best time is 3:21 (min:sec). Total time: approximately 14:30 hours. Even though the main game is not long too there’s enough to do after you beat it to keep you entertained. Just like previous GBA Castlevania games, this one has a couple of extras. Boss Rush: can be unlocked by beating the game with the good ending. You can use your save file and take any experience, souls, weapons, armor, and accessories you have into battle. The recovery items you can use are fixed, though. You fight 10 bosses in succession and you can get different items depending on your time. These items can only be obtained through this mode and they are added to your save file. You can also play as Julius in this mode. Hard Mode: In Hard Mode, enemy stats are increased making the game harder. 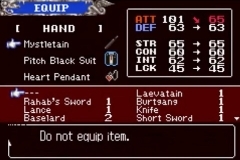 There are also some items that can only be acquired in Hard Mode. You can obtain Hard Mode by beating the game with the good ending. Julius Mode: You can play as Julius in this mode which has no story. He uses the Vampire Killer and traditional Castlevania subweapons instead of Souls. The game ends after you defeat Graham. In order to access this mode, put in Julius as your name after you get the good ending. Sound Test: You can access a sound test after you get the good ending. Worst Ending: Defeat Graham by equipping the Flame Demon, Succubus, and Giant Bat Souls then loose to Chaos. This is actually my favorite ending. Bad Ending Defeat Graham without equipping the Flame Demon, Succubus, and Giant Bat Souls. Good Ending Defeat Graham with the Flame Demon, Succubus, and Giant Bat Souls equipped and then defeat Chaos. Best Ending Defeat Graham with the Flame Demon, Succubus, and Giant Bat Souls equipped and then defeat Chaos. You need to have 100% of souls collected. Castlevania: Aria of Sorrow is the best of the GBA Castlevanias, by far. It’s even better than most other Castlevania games. The graphics and music are phenomenal and the gameplay is even better than that of Symphony of the Night, even though other areas don’t compare. The game itself is a little short but there’s plenty to do once you finish the main quest. Castlevania’s swan song on the GBA is my favorite GBA game of all time and I can’t wait to play it again once more. Trivia: Igarashi wished to try a "different route" for the series with Aria of Sorrow via placing the game in a futuristic setting. Ayami Kojima, who had previously collaborated with Igarashi on the designs for the characters of Symphony of the Night and Harmony of Dissonance, was brought into the project. Following the "different route" motif, the character designs were made more contemporary, using modern clothing over the more medieval look of the previous Castlevania installments. In developing the game's back story, Igarashi partially based it on Nostradamus's prediction of a "big evil lord in 1999" and the 1999 solar eclipse in Eastern Europe. 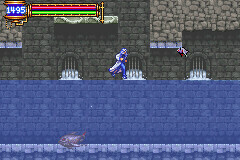 Though Aria of Sorrow was successful, its sales figures failed to meet expectations and prompted the switch to anime-style designs in Dawn of Sorrow. Very (very!) thorough review, as usual. Good stuff! Aria is by far my favorite (and IMO the best) portable Castlevania game. I don't know if it's better than SOTN (which I played for the first time AFTER Aria), but it's certainly up there. Aria is probably my favorite Castlevania. Easily my favorite Metroidvania. A lot of people prefer Dawn, but its additions felt like subtractions to me. You are a reviewin' BEAST! Great review. You know, I am one of the few who prefers CotM over this one, but I haven't played either in so long. You are making me want to take Wario Ware: Twisted from my GBA and give these games another whirl! I also love CotM! It might be unbalanced, but it's a fun, challenging game that doesn't get enough credit. Aria is not only my favorite Castlevania game, but it's one of my favorite games of all time. It's a pitch-perfect action RPG and exploration game with gorgeous graphics and art, it basically combines everything I love about video games into one delicious package. Dawn suffered from more-of-the-same-itus, it's a really great game though. Your reviews make me feel like I'm a lazy bum. Anyway, liked the game. But honestly, even though it seems to be many people's favorite of the handheld games, I preferred others to it, including the (sequel?) Dawn of Sorrow. Thanks all! I actually finished Dawn of Sorrow before finishing this review and I already have the outline done. I should have that review up by this weekend or the next week. It was better this way because it gave me a chance of comparing both games before writing about them. Sir Master, you've set the bar high for what constitutes a review, well done! Your attention to every detail blurs the line between a review and editorial, giving a complete sense of what this game is really all about. Very thorough indeed. Ah, @sirmastersephiroth, using an outline sounds like a good tool to use prior to the actual writing. I'll have to try that if you don't mind. Aria of Sorrow is a game I haven't played in ages, but it's definitely well remembered and has left a lasting impression on me, just as it did with you. The boss battles you highlighted (love the gifs), and the songs you picked out, are just a few reminders of why this game has a special place in the GBA library, and the Castlevania series as a whole. I have to ask: do you know if the character art (the image with the caption: The Cast of Aria of Sorrow) is from an official art book or something? It looks like something I would like to have in my collection. I remember enjoying the story. It is the only story in a Castlevania game I remember being really interested in. Music was phenomenal. My only gripe with the game was that I remember it being incredibly easy. And in retrospect, I wish Castlevania had less reliance on the same bosses (like the giant ball of mummies and other things). Mmm, I have this one in my backlog, good to know I have an excellent game to look forward to! Wow you burned through this game in a little over 5 hours? Impressive! Everyone seems to love this game - and I really dig it - but something just felt "off" to me about this one. Maybe it was the map and castle layout - didn't feel very comprehensive to me, nor did it "flow" together all that well. I may be nit-picking though, overall it's great. I prefer the sequel to this one, but it's certainly no slouch. Also, I forgot about the music in this game. I don't remember it being so good. I'm (pleasantly) surprised. It's not quite among my series favorites, but I also didn't play it until Konami released the Castlevania Double Pack. And since I had just finished Harmony of Dissonance before playing AoS, I guess I was sort of burnt out and maybe didn't give it a fair shake. I did beat the game, but I never played much of Julius Mode or bothered grabbing any specific souls. But wow, the game looks a LOT better than I remember. If I wasn't already wasting all my free time on Harmony of Despair, this review would have put me in the mood to dig Aria of Sorrow out and give it another go. @Guillaume I find the gameplay and story better than SOTN, but everything else is better in SOTN. The story in SOTN is pretty good too, though. @Anand I'll give you my take on Dawn of Sorrow very soon. @ploot It will be an honor to take Wario Ware: Twisted out of your GBA! @Zero You have a full time job which requires a lot of "homework" on your part, a girlfriend, plus you run this site. I don't think you can fit being lazy into your schedule. @roykoopa64 Thank you! Outlines help a lot. That way I don't forget to put stuff in. And yes the art is from an official art book from Castlevania in general. @PogueSquadron I'd recommend starting it on Hard Mode. It's more of challenge but you also get powerful items which increase your luck stat, making getting 100% of souls easier. @anon_mastermind Spoiler: All GBA/DS games are worthwhile plays (some more than others, though). @GameDadGrant I've played it a couple of times, so that helped. @nate38 It's good to have a break between Castlevania games, lest you burn out. I can't afford that too much, though. I still have 3 Castlevania reviews to write. I'm playing Portrait of Ruin right now. How's Harmony of Despair? I'm really interested in it, but I hate having to lock down some time with someone to play it. Is it enjoyable as a standalone game? Great review Sirmastersepiroth, as usual. 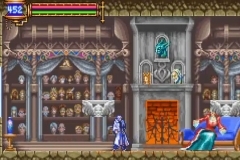 Aria is not only the best GBA Castlevania game, but it could also be the best portable Castlevania, period. While the anime presentation and game length was a little let off, AoS perfectly replicated the SOTN gameplay in a handheld. I hope the next portable Castlevania game shakes things a little though. 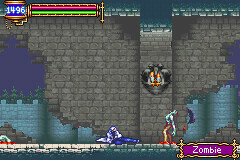 I'd like it to be more of an hybrid of old school Castlevania and Metroidvania, rather than one or the other. Try, a Simon's Quest sequel in the post-SOTN era. 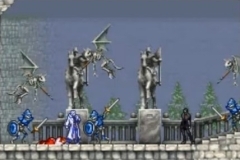 Order of Ecclesia was basically a Simon's Quest game, yeah? I prefer Circle of the Moon, but I remember this one being good. I played them all in succession though so they kind of all blur together. Not really. Yes, the game had a couple of towns, but most areas weren't interconnected together and you didn't have to solve a puzzle to unlock the next area. The game was pretty by-the-books in that aspect. Still, I agree that Order of Ecclesia had some of the ideas that Simon Quest had. Unfortunately, it didn't play anything like Simon's Quest did (from what I remember anyway). It's definitely not a bad game. But the whole crafting/grinding thing kind of bugged me. I prefer Aria's tight design, where you have to find the best weapons in the castle and the souls only have one level. Iga can only do so much original content with his budget! You know what are cheap, though? Empty hallways. @gencid Thanks! I need to play Simon's Quest before I play order of Ecclessia. I'm actually planning an editorial after I finish reviewing all the portable games. I haven't put it in the contribution schedule because I have no time frame for it. I'm already writing the outline, though. I even have the basic plot thought out. I actually have two plots because I think there are, at least, two very cool stories that can be told using the already established universe. I may have a third plot but it requires a different type of gameplay from the first two stories. I'm actually pretty excited by this editorial! @sirmastersephiroth And I make music! When I find the time. Which lately, is not at all.